Text Expanders are an advanced form of the clipboard, one that does the duty of filling in tedious lines and phrases in a repetitive manner. The Text Expanders will often help you shave off a remarkable amount of time for the work. For instance, someone working in chat support can write ‘hru‘ everytime a new query comes in, and text expansion app will automatically expand it to “hello, how are you“. In my research for best text expansion apps for macOS, I came across heaps of text expanders on App Store; While almost every text expander app for macOS is paid, they do vary a lot in terms of features, ease of use and cross-platform support. Overall, after trying and testing dozens of text expanders, I shortlisted some of the best one in this article. So, let’s check them out, shall we? Well, the Text Expander is often regarded as a classic text Automator and is arguably one of the best names in this business. Despite its soaring popularity, the Text Expander users were baffled when the makers moved to a subscription service and offered the same at an annual rate of $40. Other cheaper alternatives offered similar experiences at a much lower price. 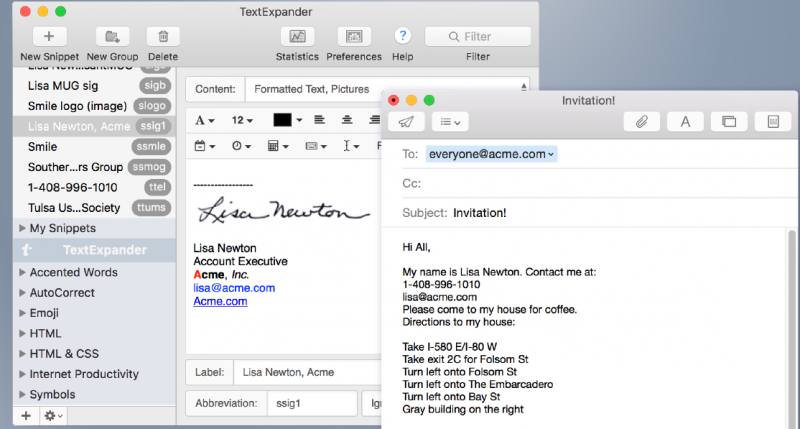 TextExpander lets users insert snippets of text from emails, boilerplate and other content whilst writing. The tool also lets you personalize with custom fields and powerful automation. Verdict- If you are looking for a text expander app that’s cross-platform, go for TextExpander. It also has an iOS app. But I feel the subscription model makes it insanely expensive. aText is marketed as a text accelerator by its makers. The aText lacks the TextExpanders interface but it does make it up when it comes to other aspects. With aText you can preset a slew of texts and other stuff that you can use as and when you want. Setting it up is effortless and thanks to the labelled fields you can easily manage your workflow. One can also setup aText to store certain phrases which will expand whenever the abbreviation that is related to them is used. Meanwhile, the auto-correction tools will help in keeping the spelling errors at bay. I personally like the manner in which the snippets and all of my other stuff can be arranged. Furthermore, the Snippets can be easily edited and can be synced across Mac, Dropbox and Google Drive. Verdict– If you are looking for an affordable text expansion app for Android with all the advanced feature, aText is you choice. But on the downside, it’s only available for macOS. It is always useful to take help from tools to do your repetitive tasks. Not only does this relieve you of the monotonous work but it will also help you complete work before the deadline. In a nutshell, Text Expander Apps will help you increase your efficiency. Dash offers one of the most simplistic ways to start adding your own snippets. Dash 3 offers a set of language documentation at the side and this is something that will help you with rules and references. 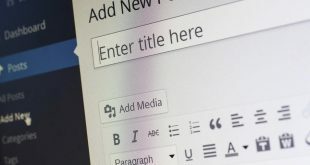 The tool allows you to create snippets by simply copying the phrase. Alternatively, you can also create custom snippets using keyboard commands. Dash allows users to setup variable placeholders, cursor positioning and data and time. Verdict– If you are a developer, Dash is better suited for you. Well, what if you don’t want to install a third-party app and use a native Mac text expander feature? Don’t worry the System Preferences covers it up. Apple has been offering native text expanding abilities since the Mountain Lion. In order to set it up, go to System Preferences>Keyboard Palette and click on the Text Tab. It is here that you will be able to create expandable snippets. That being said the Text Expansion options are very basic in nature but if you want to shave some time off your writing this is a good bet. 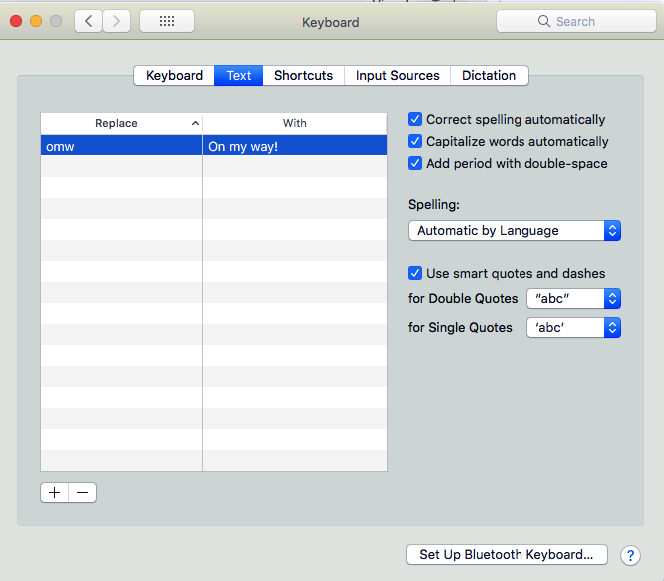 Interestingly the System Preferences also offers a Spelling check mode along with smart quotes and dashes features. Pros– Free of cost and requires no installation. 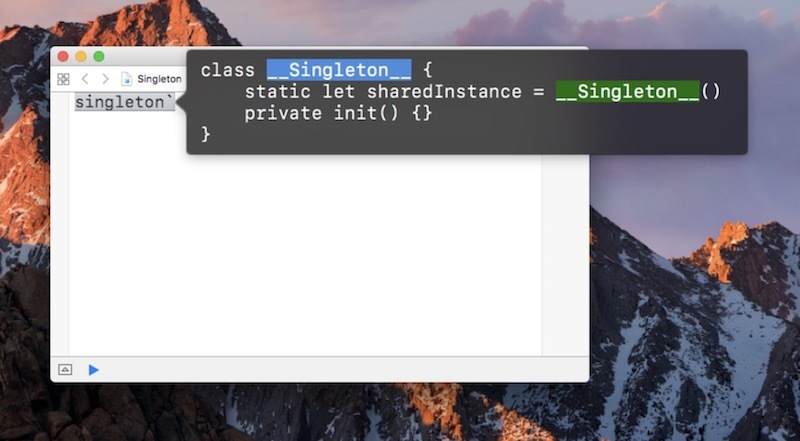 Cons– Unlike third-party text expander like aText, which works anywhere you can type, the built-in text expansion in macOS, doesn’t work in every text input field. For example, in my testing, it didn’t work in Google Drive, but aText worked fine. Also, don’t expect any advanced option from this build in text expansion app. The Keyboard Maestro is an offering that is more or less designed on the lines of Text Expander. In case you are looking out for a Text Expander alternative, the Keyboard Maestro should ideally pop up first on your list. The Keyboard Maestro focusses on text expanding needs and it does it rather well. All the features including the abbreviations and the actions are customizable on a character level. 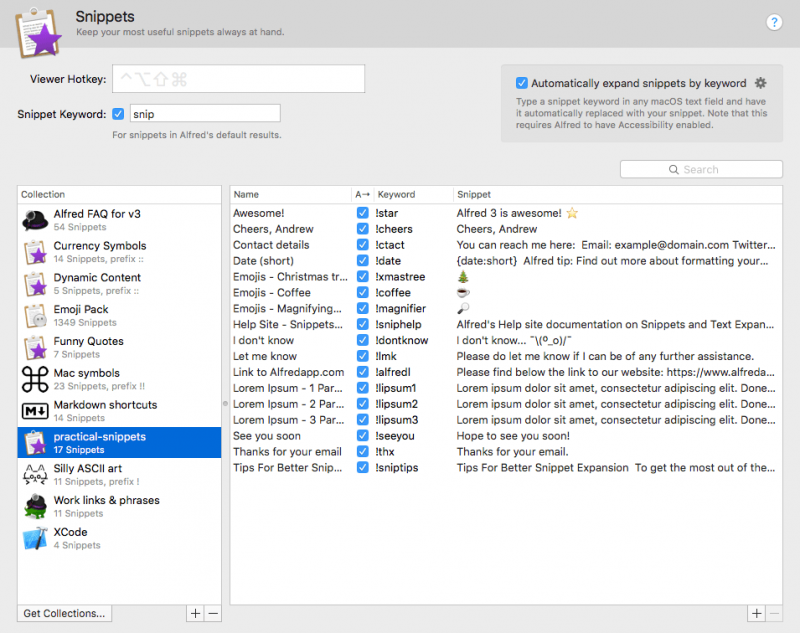 The snippets can be saved at multiple levels so that none of your previous entries is overwritten. One can also add Text Tokens for macros and this eventually helps in creating calculation tables, dates, and IP addresses. Thanks to the comprehensive level of customization one can use the piggybacking options to expand the texts in several ways. This will help the Keyboard Maestro users automate words and sentences. 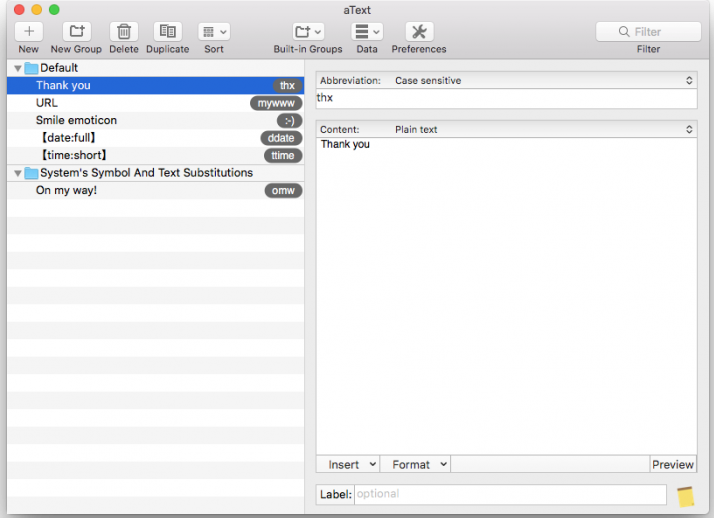 Earlier on I had heard a lot about Alfred, an award-winning Text expander app for the Mac. I tried it for a couple of days and I must say it does deserve the attention it is getting. Before we begin let me clear this up, the Alfred offers a ton of nontext expander features and yet it manages to deliver on its promise. With the Alfred, Mac users can search and browse applications. The algorithm will learn how you search and fine tune the results accordingly. Alfred offers hotkeys for accessing clipboard history and also allows users to create their own snippets and expand an abbreviation into a full-text snippet. 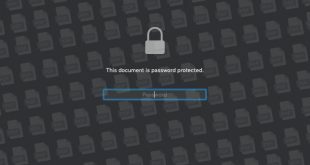 The clipboard history supports any type of files including text, image or even individual files that you had copied earlier. I personally loved Alfred for its multi-purpose approach and strongly believe that you should give it a try as well. Text Expander apps are a true saviour when it comes to handling repetitive work. 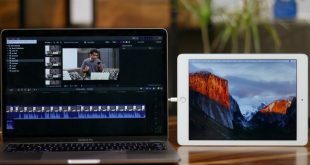 I have been using Text expander apps across both Windows and Mac. Truth be told, I cannot fathom my life without these nifty little tools. I would personally suggest you try the apps before you decide to purchase.